A majority of the studies have additionally shown that the prevalence of eye strain is associated with an increase in the time spent on computers.16 The previous studies indicated that longer duration tends to have long-lasting visual complaints.17–21 One of the other significant strategies for reducing eye strain is to take regular rest breaks. Kevin Taylor of Niche Software Ltd conducted an overview of research on repetitive strain injury (RSI) and the effectiveness of breaks. The author looked at the effect of introducing supplementary breaks to a working regime and concluded that in addition to their positive effects on ratings of musculoskeletal discomfort, supplementary rest breaks also led to decreased levels of eye soreness and visual blurring.22 The effectiveness of micro-breaks or supplementary rest breaks has been studied in detail. The conclusions were that more frequent micro-breaks produced the greatest reduction in discomfort.23 However, it is questionable that how often breaks should be taken, especially by staff computer users in an educational sector to reduce eye strain. The timing of breaks needs to be carefully considered to be accepted by the stakeholders. Otherwise, staff computer users may face some barriers, including supervisors’ lack of awareness of eye strain. Therefore, staff may not be allowed to take rest breaks while using computer continuously for a long period. Thus, the involvement of the executive and relevant stakeholders is very important for developing the program to reduce eye strain. A participatory approach is one of the strategies that has been applied to ensure the development of a sustainable health promotion program. This approach enables stakeholders to extend their understanding of problems and to formulate actions directed toward the resolution of these problems. Participants could make decisions about personal health behaviors, use of available health resources, and social health issues.24,25 Therefore, a participatory approach was used in this study in which enables staff computer users and other stakeholders to share their perceptions and ideas for developing the practical program in reducing eye strain. Sukhothai Thammathirat Open University (STOU) was selected for this study due to the widespread use of computers in educational services throughout Thailand and beyond.26 In particular, the prevalence of high eye strain in STOU was 84.7%.10 The findings suggest that rigorous studies for the development of suitable program to reduce eye strain are needed.10 The main purpose of this study was to develop a participatory eye care (PEC) and assess the effectiveness of the program by comparing eye care knowledge, attitude, and practice (KAP), as well as eye strain symptoms in staff computer users. The study used a two-phase mixed methods design. A participatory approach was held by organizing a stakeholder meeting. A potential group of 26 stakeholders were invited to participate in the 5-hour meeting, including the vice president of STOU, 11 directors of the offices, one health professional staff of Office of Health Service, two experts of School of Nursing and School of Health Science, and 11 representatives of staff computer users from 11 supporting offices recruited by using simple random sampling on a voluntary basis. All stakeholders were informed about the existing eye strain situation and factors contributing to eye strain among staff computer users in STOU. The 3-hour course on computer eye strain at the beginning of the program: the course content included symptoms of eye strain, causes and risk factors, and preventive measures. Additional rest breaks: there were short and long breaks provided for the participants. A total of 30-second break every 30 minutes of computer work was provided, giving the participants a brief period to relax their eyes, stretch their body, and adjust their posture. During 15 minutes rest break in the morning and the afternoon, the participants would be recommended to do integrated eye–neck exercises and take rest after that. The audiovisual break reminders were set up to warn the participants to take breaks and do integrated eye–neck exercises on schedule as defined in Table 1. 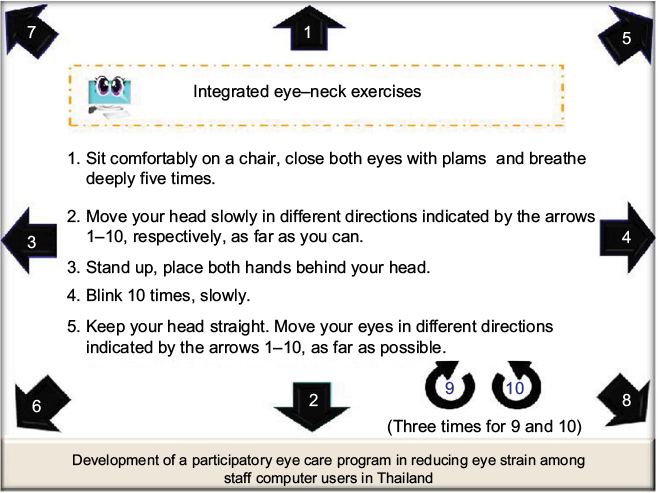 The medium for integrated eye–neck exercises was designed on a mouse pad screen printed with instructions of the exercises as shown in Figure 1. Figure 1 Mouse pad designed for integrated eye–neck exercises. The quasi-experiment was conducted to evaluate the effectiveness of the PEC program. There were 11 academic supporting offices in STOU. The Office of Academic Affairs and the Office of the University Press were selected for intervention and control groups, respectively, based on their similar work characteristics, including duration of computer work and type of desktop computer, table, and height-adjustable chair. Lighting and temperature conditions of the intervention and control groups met standards by Thai law; Ministerial Regulation on the Prescribing of Standard for Administration and Management of Occupational Safety, Health and Environment in relation to Heat, Light and Noise, B.E. 2549 (A.D. 2006), in accordance with the OHSA regulations. The illumination of computer work station ranged between 500 and 700 lux, ambient indoor temperature was between 73°F and 78°F (23°C and 26°C), and relative humidity of the air was between 50% and 70%. The sample size was calculated to reach a statistical power of 0.95, significance level of α=0.05, and statistical power of 1−β=0.80 and increased by 10% for the subjects who may leave or quit from the experiment. Thus, the total sample size was 35 subjects each in the intervention and control groups. The participants who met the inclusion criteria were recruited from the list of staff in each office by random selection on a voluntary basis. The selection criteria were 1) 25–50 years of age; 2) work experience with computer for at least 1 year; 3) work with computer ≥4 hours/day for 5 days a week; and 4) willing and available for 8-week course of study. Staff with any of the following conditions were ineligible: 1) presently under medical treatment for eye and visual problems and 2) permanently under medication of analgesics, NSAIDs, antidepressants, and hypnotics. The PEC program had been implemented for the intervention group. A total of 35 participants enrolled in the intervention trial and completed daily practice on a log sheet for the entire 8-week intervention. Both the intervention and control groups were measured three times as baseline data at the beginning of the program, follow-up 1 (week 4), and follow-up 2 (week 8). Part 1: demographic data and characteristics of work – there were 25 questions, including general information of gender, age, education levels, underlying disease, eyesight problems, water intake, hours of sleep, the use of computers in leisure activities, duration of the career working with computer, and duration of computer use per day. Part 2: knowledge on eye strain – there were 16 questions to assess the knowledge of computer eye strain, including risk factors, health effect, and the preventive measures. A correct answer was given 1 score and a wrong answer 0 score. The scores varied from 0 to 16 points and were classified into three levels as Bloom’s cutoff points, where scores of 81–100%, 60–80%, and <60% were classified as good knowledge, satisfactory knowledge, and poor knowledge, respectively. Part 3: attitudes about computer eye strain – there were 12 questions to assess the attitude of the respondents toward computer eye strain. The questions had positive and negative responses ranging from strongly agree, agree, uncertain, disagree, and strongly disagree. A score of 1–5 was given to the answers based on the Likert scale. The sum score of attitudes was assessed based on Bloom’s cutoff point (60%–80%).27 The attitude scores varied from 0 to 60, and these scores were classified based on the attained score in three levels, where 48–60 scores (81%–100%), 36–47 scores (60%–80%), and 12–35 scores (<60%) represented concern, neutral, and not concern attitude, respectively. 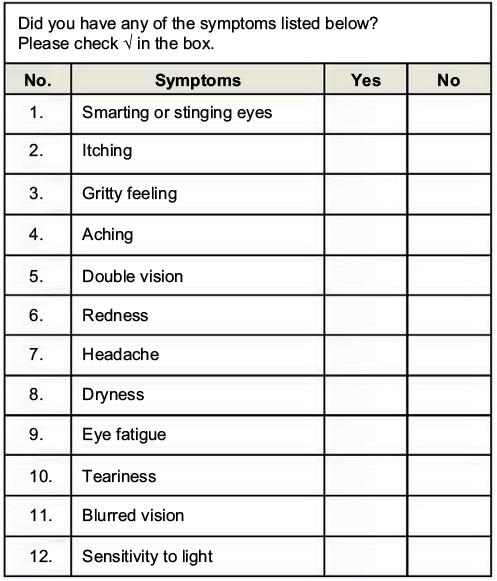 Part 4: practice of eye care in computer use – there were 12 questions, which included both positive and negative. The questions asked about the actions taken by each respondent, such as the frequency of taking regular rest breaks, doing eye exercise, and blinking during working with computer. The sum score of practice was assessed based on Bloom’s cutoff point (60%–80%).27 The scores varied from 12 to 48 and were classified into three levels of 39–48 scores (81%–100%), 29–38 scores (60%–80%), and 12–28 scores (<60%) representing good practice, fair practice, and poor practice, respectively. Figure 2 Questions about eye strain symptoms. The content validation was performed by five experts in ophthalmology, ergonomics, and occupational health with the use of the Index of the Item-Objectives Congruence (IOC) forms. It was found that 77 items with the IOC between 0.80 and 1.00 were congruent with the objectives. The questionnaire had a test–retest reliability over a period of 2 weeks (n=30, r=0.72), an internal consistency reliability for knowledge (KR-20=0.76), and the Cronbach’s alpha (CA) for attitude (0.81) and practice (0.84). Ethical view protocol no. 121.1/56 was approved by the Ethics Review Committee for Research Involving Human Research Subjects, Health Science Group, Chulalongkorn University. Written informed consent was obtained from all participants who were enrolled in this study. Six research assistants were trained to interview and assess on KAP scores and eye strain symptoms among the study subjects. All participants in the intervention group were asked to complete daily practice on a log sheet for the entire 8-week intervention at the end of each day. Each participant indicated the number of rest breaks taken and integrated eye–neck exercises performed that day. Data on eye strain symptoms and KAP scores of both groups were collected three times for baseline, follow-up 1 (week 4), and follow-up 2 (week 8). Data collection within the experimental phase is shown in Figure 3. Figure 3 Data collection within the intervention trial. Abbreviation: PEC, participatory eye care. The results of the study are divided into three parts as follows. Baseline characteristics of the intervention and control groups are presented in Tables 2 and 3. Independent t-test was used to compare normally distributed continuous variables, and chi-square test was used for comparison of categorical variables. The results from Tables 2 and 3 found that education level had a significant difference between the intervention and the control groups, and no significant difference between groups was found for the other variables. Notes: *Statistical significance for p-value <0.05. Notes: Independent samples test equal variances assumed. aIndependent samples test equal variances not assumed. A total of 35 participants enrolled in the intervention trial and completed daily practice on a log sheet for the entire 8-week intervention. 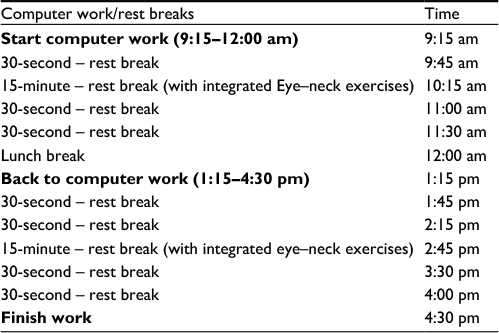 All participants in the intervention group performed at least 85% of rest breaks taken and the integrated eye–neck exercises complied with the schedule. The main reasons that caused the participants unable to comply with the entire schedule of PEC program were regular meetings, conferences, and special events that the participants had to attend. The effect of the program on eye strain symptoms was analyzed by using descriptive statistics and chi-square test. The results found that at baseline, 80% of the intervention group and 85.7% of the control group had eye strain. After the PEC program implementation, the rate of eye strain in the intervention group had reduced significantly from 80% to 25.7% (follow-up 1) and 28.6% (follow-up 2), whereas in the control group, the rate of eye strain had slightly reduced from 85.7% to 77.1% (follow-up 1) and 80.0% (follow-up 2) as shown in Table 4. There was no significant difference in the eye strain rate between the intervention and the control groups at baseline (χ2=0.402, p-value=0.526). However, significant differences were found between the intervention and the control groups at follow-up 1 (χ2=18.529, p-value<0.001) and follow-up 2 (χ2=18.651, p-value<0.001). Descriptive statistics and General Linear Model Repeated Measures were used to analyze KAP scores for baseline, follow-up 1 (week 4), and follow-up 2 (week 8) after the PEC program implementation. Compared within the same group, the mean knowledge scores of the control group at baseline, follow-up 1, and follow-up 2 were at the level of satisfactory knowledge of 10.17, 10.60, and 10.54, respectively. While the mean knowledge score of the intervention group at baseline was at the level of satisfactory knowledge of 9.91, after PEC program implementation, the mean knowledge score was increased at follow-up 1 and follow-up 2, which was at the level of good knowledge of 13.74, and 13.71, respectively. The mean attitude score of the control group at baseline, follow-up 1, and follow-up 2 was at the level of neutral attitude of 38.51, 38.31, and 37.63, respectively. While the mean attitude score of the intervention group at baseline was at the level of neutral attitude of 37.54, after PEC program implementation, the mean attitude score was increased at follow-up 1 and follow-up 2, which was at the level of concern attitude of 48.09 and 48.20, respectively. The mean practice score of the control group at baseline, follow-up 1, and follow-up 2 was at the level of poor practice of 27.63, 27.51, and 27.29, respectively. While the mean practice score of the intervention group at baseline was at the level of poor practice of 28.49, after PEC program implementation, the mean practice score was increased at follow-up 1 and follow-up 2, which was at the level of fair practice of 38.03 and 37.06, respectively. Mean scores on KAP of the intervention and the control groups are shown in Figure 4. Figure 4 Mean scores on KAP of the intervention and the control groups. Abbreviation: KAP, knowledge, attitude, and practice. Compared with baseline (time 1) in the same group, the intervention group obviously had increased KAP scores (p<0.001) at follow-up 1 (time 2) and follow-up 2 (time 3) as shown in Table 5. However, there was no significant difference in the KAP scores between follow-up 1 (time 2) and follow-up 2 (time 3) of the intervention group. On the contrary, the result drawn from analysis showed that there was no significant difference in the KAP scores of the control group between each time of measurement. Notes: Based on estimated marginal means. aAdjustment for multiple comparisons: Bonferroni. bThe mean difference is significant at the 0.05 level. I and J represent different times for post hoc test. Abbreviations: PEC, participatory eye care; KAP, knowledge, attitude, and practice. 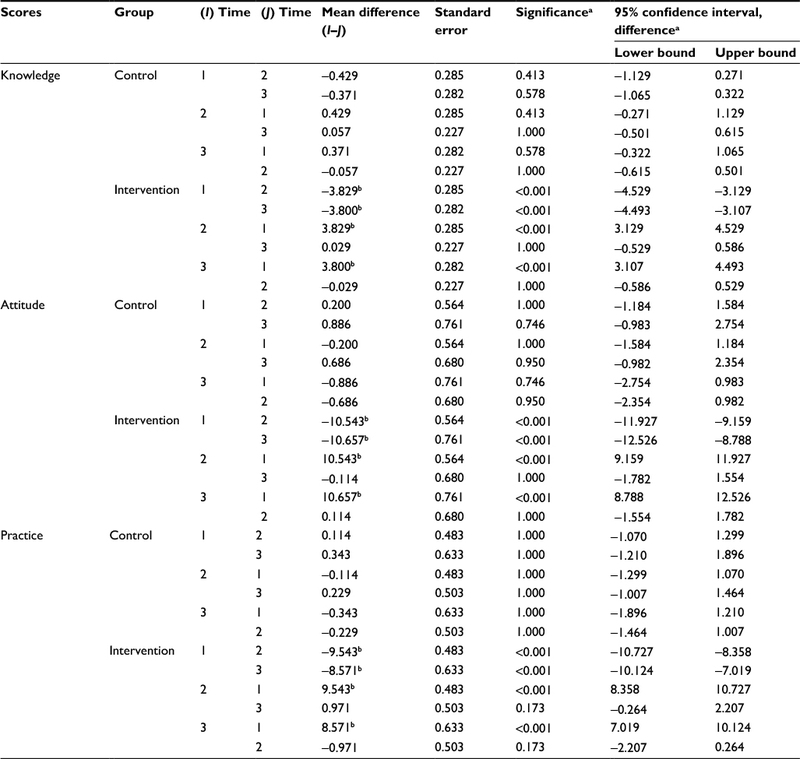 The results from Tables 2 and 3 show that there was no significant difference in the baseline characteristics between the intervention and the control groups, except for education level, where the intervention group had a higher number of participants with master’s degree than those in the control group. However, the earlier studies have not mentioned causation between education level and eye strain. In addition, the recent study has limitation on the proportion of males and females, with more females than males in both groups. The association of this factor with eye strain was reported in several studies that found that eye strain was higher in females and the older group of computer users. 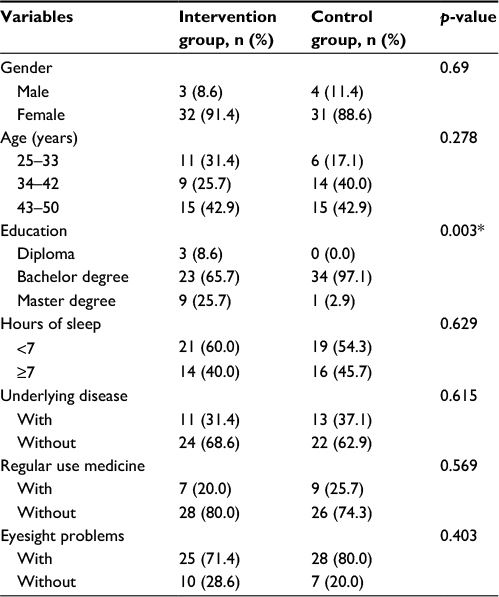 Accommodative and vergence dysfunction are more prevalent in females, thus increasing their risk of having moderate to high visual discomfort.16 However, some studies by Bhanderi et al17 and Agarwal et al18 did not find any significance with the age and gender of the subjects with eye strain and these ocular complaints. Therefore, this issue should be addressed in future studies. Additionally, one of the significant strategies for reducing eye strain is taking regular rest breaks, in accordance with the study by Galinsky et al31 that reported that supplementary breaks reliably minimized discomfort and eye strain without impairing productivity. Moreover, the medium for integrated eye–neck exercises was developed on a mouse pad, which complied with the consensus of stakeholders by the participation approach to serve the needs of the users in this study. The noticeable finding of this study is that at baseline, the practice scores of the intervention and the control groups were at the poor level in spite of having satisfactory knowledge and neutral attitude. These results are consistent with the earlier research by Bali et al that aimed to study the KAP toward computer vision syndrome prevalent in 300 Indian ophthalmologists. 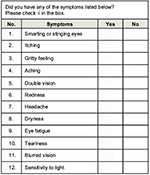 The study found that the chief presenting symptom was eye strain (97.8%); all the doctors who responded were aware and more informed of symptoms and diagnostic signs but were misinformed about treatment modalities.32 However, in this study, after the PEC program implementation, the mean scores of the intervention group at follow-up 1 and follow-up 2 were increased to the level of good knowledge, concern attitude, and fair practice. This could be explained by the fact that the PEC program consisting of the training course on computer eye strain at the beginning of the program could provide knowledge on both theory and practice. The course content included symptoms, causes and risk factors, and preventive measures of eye strain. This might be involved in increasing the KAP scores in the intervention group. Another factor that could contribute to increasing the practice score is that the intervention group was reminded by the audiovisual break reminder with both sound and text to take regularly scheduled breaks, which was designed to comply with the nature of work and culture of the organization. The results are consistent with the studies of the effects of micro-breaks in terms of reduced discomfort, which reported that scheduled breaks were found to be generally more effective than allowing the worker to take breaks on their own and more frequently micro-breaks produced the greatest reduction in discomfort.23,33,34 In addition, the important factor that may benefit the effectiveness of the PEC program is a participatory approach to stakeholder engagement, which was used to develop the program, including the schedule of additional rest breaks set up to meet the practical needs of the users in accordance with the acceptance of the executive and stakeholders in this study. The present study had some certain limitations. Since the evaluation of eye strain was self-reported, this may have led to self-reporting bias and subjectivity. However, the researcher had attempted to control the bias by means of using standard definition for specific symptoms of eye strain and face-to-face interviewing by six trained research assistants. Additionally, the program was specifically designed to meet the needs of staff computer users in STOU. This study offers evidence that the PEC program was effective in improving the knowledge, attitude, and practice scores, as well as reducing eye strain symptoms. The composition of all strategies significantly associated with a lower rate of eye strain through the participatory approach made it a successful program for the staff computer users in the study. It is recommended that the PEC program can be applied to use as a preventive tool in reducing eye strain among computer users in other sectors. However, the program was specifically designed to meet the needs of staff computer users and other stakeholders in STOU. Thus, more research is needed to apply the program for the computer users in other sectors, such as the industrial and the service sectors, which have various natures of work and corporate cultures. The authors gratefully acknowledge financial support from the 90th Anniversary of Chulalongkorn University Fund (Ratchadaphiseksomphot Endowment Fund). Great appreciation is also offered to executives, directors, and staff computer users of STOU who participated in this study. Loh K, Redd S. Understanding and preventing computer vision syndrome. Malays Fam Physician. 2008;3(3):128–130. Khalaj M, Ebrahimi M, Shojai P, Bagherzadeh R, Sadeghi T, Ghalenoei M. Computer vision syndrome in eleven to eighteen-year-old students in Qazvin. Biotech Health Sci. 2015;2(3):e28234. Atencio R. Eyestrain: the number one complaint of computer users. Comput Libr. 1996;16(8):40–44. Sullivan JM. Visual Fatigue and the Driver. Ann Arbor: The University of Michigan Transportation Research Institute; 2008:2–6. ICD10 Data.com [webpage on the Internet]. Unspecified subjective visual disturbances; 2016 [cited November 24, 2016]. Available from: http://www.icd10data.com/ICD10CM/Codes/H00-H59/H53-H54/H53-/H53.10. Accessed February 5, 2017. Dahl AA [webpage on the Internet]. Eye Strain [cited December 18, 2014]; 2014. Available from: http://www.medicinenet.com/eye_strain/article.htm. Accessed February 5, 2017. Hemphälä H, Johansson G, Odenrick P. Lighting recommendations in operating theatres. In: The Proceedings of the 17th World Congress on Ergonomics; 2009; Sweden: Lund University Publications. The London Clinic [webpage on the Internet]. Eye strain; 2014 [cited September 18, 2015]. Available from: http://www.thelondonclinic.co.uk/conditions/eye-strain. Accessed February 8, 2017. Lutron Electronics Co. A Management Report on the Correlation between Workstation Lighting and Computer Vision Syndrome. Coopersburg: 1998. Lertwisuttipaiboon S, Pumpaibool T, Neeser KJ, Kasetsuwan N. Associations of preventive strategies with symptoms of eye strain among Sukhothai Thammathirat Open University staff in Thailand. J Health Res. 2016;30(1):33–38. Vertinsky T, Forster B. 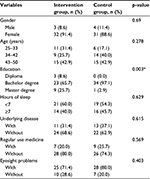 Prevalence of eye strain among radiologists: influence of viewing variables on symptoms. AJR Am J Roentgenol. 2005;184(2):681–686. Thomson WD. Eye problems and visual display terminals – the facts and the fallacies. Ophthalmic Physiol Opt. 1998;18(2):111–119. Kozeis N. Impact of computer use on children’s vision. Hippokratia. 2009;13(4):230–231. Thorud HM, Helland M, Aarås A, Kvikstad TM, Lindberg LG, Horgen G. Eye-related pain induced by visually demanding computer work. Optom Vis Sci. 2012;89(4):E452–E464. Gosewade NB, Shende VS, Kashalikar SJ. Effect of various eye exercise techniques along with pranayama on visual reaction time: a case control study. J Clin Diagn Res. 2013;7(9):1870–1873. Shantakumari N, Eldeeb R, Sreedharan J, Gopal K. Computer use and vision-related problems among university students in Ajman, United Arab Emirate. Ann Med Health Sci Res. 2014;4(2):258–263. Bhanderi DJ, Choudhary S, Doshi VG. A community-based study of asthenopia in computer operators. Indian J Ophthalmol. 2008;56(1):51–55. Agarwal S, Goel D, Sharma A. Evaluation of the factors which contribute to the ocular complaints in computer users. J Clin Diagn Res. 2013;7(2):331–335. Bergqvist UO, Knave BG. Eye discomfort and work with visual-display terminals. Scand J Work Environ Health. 1994;20(1):27–33. Hanne W, Brewitt H. Changes in visual function caused by work at a data display terminal. Ophthalmologe. 1994;91(1):107–112. Kanitkar K, Carlson A, Richard Y. Ocular problems associated with computer use: the ever-increasing hours spent in front of video display terminals have led to a corresponding increase in visual and physical ills. Rev Ophthalmol E Newsl. 2005;12:4. Taylor K, Wellnomics [webpage on the Internet]. An overview of the research on RSI and the effectiveness of breaks [cited September, 30 2016]. Available from: http://www.workpace.nl/support/research/white-papers/an-overview-of-the-research-on-rsi-and-the-effectiveness-of-breaks/. Accessed February 8, 2017. Henning RA, Sauter SL, Salvendy G, Krieg EF. Microbreak length, performance, and stress in a data entry task. Ergonomics. 1989;32(7):855–864. Laosee O. A Participatory Approach to Develop Strategies to Increase the Swimming Ability of Primary School Children [Doctoral dissertation]. Thailand: Chulalongkorn University; 2010. Clark JM. Nurse in the Community. Norwalk, CT: Appleton & Lange; 1992. Pachanee C, Lim L, Bain C, Wibulpolprasert S, Seubsman S, Sleigh A. Smoking behaviour among 84,315 open-university students in Thailand. Asia Pac J Public Health. 2011;23(4):544–554. Yimer M, Abera B, Mulu W, Bezabih B. Knowledge, attitude and practices of high risk populations on louse- borne relapsing fever in Bahir Dar City, North-West Ethiopia. Sci J Public Health. 2014;2(1):15–22. Takada M, Miyao M, Satoh M. Effect of accommodation training on visual function of visual inspection workers and middle-aged people. J Sports Med Doping Stud. 2012;2:112. Goswade NB, Shende VS, Kashalikar SJ. Effect of various eye exercise techniques along with pranayama on visual reaction time: a case control study. J Clin Diagn Res. 2013;7(9):1870–1873. Rawstron JA, Burley CD, Elder MJ. A systematic review of the applicability and efficacy of eye exercises. J Pediatr Ophthalmol Strabismus. 2005;42(2):82–88. Galinsky T, Swanson N, Sauter S, Dunkin R, Hurrell J, Schleifer L. Supplementary breaks and stretching exercises for data entry operators: a follow-up field study. Am J Ind Med. 2007;50(7):519–527. Bali J, Navin N, Thakur BR. Computer vision syndrome: a study of the knowledge, attitudes and practices in Indian Ophthalmologists. Indian J Ophthalmol. 2007;55(4):289–293. McLean L, Tingley M, Scott RN, Rickards J. Computer terminal work and the benefit of microbreaks. Appl Ergon. 2001;32(3):225–237. Henning RA, Jacques P, Kissel GV, Sullivan AB. Frequent short breaks from computer work: effects on productivity and well-being at two field sites. Ergonomics. 1997;40(1):78–91.